We get to decide just how extraordinary we will be in our lives. But our default tends towards making “safe decisions”. And the danger of only making safe decisions is that we don’t grow. 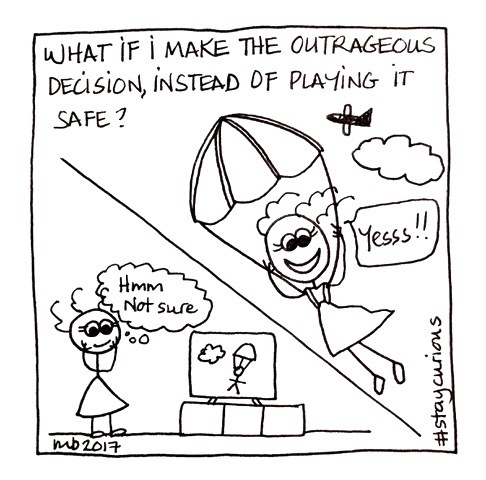 So how about making a few outrageous decisions instead of only sticking with safe? Outrageous decisions don’t have to be risky, but do involve pushing yourself outside of your comfort zone. You can read more about making better decisions over on Medium, where my new piece for Do Lectures Do Contribute is now live. It’s called “Be Outrageous, Choose to Grow“. decisionsstay curiouswhat if I can?